hope you are refreshed after a nice long wave on Pound/ Yen yesterday and managed to put some of our 140pips in the bank. Some may even have left a portion of the trade open and are still counting. Our analysis yesterday was beautiful on Euro/Dollar with price bouncing beautifully off the confluence of our Beta support trendline, Daily Pivot and very near our Daily Critical Zone. Sadly, despite our continuation rectangle preparing us for the move, they went like a rocket 173 pips without an opportunity for us to enter. This of course is part of being a currency trader – moves will happen without entry signals and we must be happy to watch the action, rather than lamenting “the one that got away”. There’s always another wave to catch! The move to the north has seen Daily Pivot cross Weekly and with Monthly below them both – we have a clear indication that the trend is now bullish. Predictably, price has consolidated throughout Asia session today until spiking 40pips to (once again) our Daily Critical Zone which is now providing resistance. Difficult to find lines to trade today as price makes new highs. My sentiment tells me that price will want to pullback to Daily Pivot and I will be looking for an opportunity to be there, if an StP setup arises. I have chosen a small pennant as my hotspot today and see this as that opportunity. I will be prepared to trade this in either direction because we are in the “GO Zone” for a long also but I would prefer to see a pullback towards DP first. 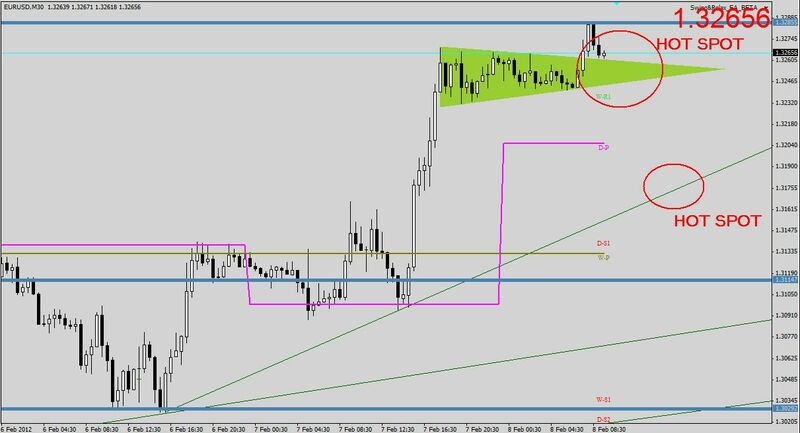 If the short entry presents itself it will be very small stake as we will be trading counter trend and above DP. Have a happy trading day everyone.